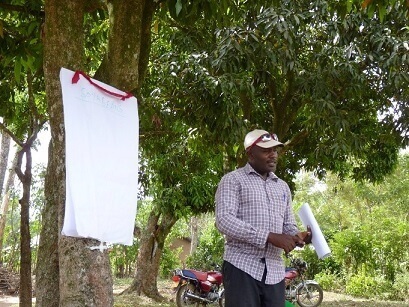 Salim is an agriculture instructor in Shianda area. Together with WEFOCO he trains local farmers in organic farming, poultry keeping and market access. He is passionate about horticulture and driven to help the community to succeed in their income generating activities. You say that fruits have a lot of potential to generate income for farmers and revive Shianda. Tell me why you think that. This area used to be under sugarcane, which is a monocrop. Using supplementary crops is better for food security. It builds capacity and offers more employment. I want to train local farmers to intercrop, so they get more value from their land. What areas do local farmers need most training in? Modern farming techniques in general. Also, about horticulture – how to plant fruits and craft them, so their production value increases. Fruits are so nutritious, by training farmers to plant fruits, we are also advocating for nutrition. Farmers also need to understand how to add value to their production. For example, you sell a raw fruit for 20 schillings, but you sell a fresh juice for 100 schillings. These things are important to understand. I also train farmers about market possibilities, where to sell and how. Tell me a little bit about your background and why/when did you switch to agriculture consultancy. Sugar has played an important part in Shianda´s economy. But it has also played a part in your life. You said you worked alongside your father in Mumias sugar factory? Yes, I was an agriculture instructor in the sugar factory. I realized already then, that sugarcane was not a useful plant for the farmers, as they had to purchase food, they could have grown themselves. I realized the value of intercropping and changing the attitude of the farmers. After the sugar factory collapsed, there were many municipal and national projects introduced in the area, such as palm oil and eucalyptus trees, that failed due to lack of research. Now people mainly grow maize and vegetables, and I think fruits and soybeans have a lot of potential here. You have been consulting farmers for a while about agriculture. Tell me some stories where you feel you have really impacted people with your trainings. In poultry and egg handling. I have taught locals about how to tackle poultry diseases and using alternative ways of treating them. I also taught them how to build their own hatcheries using locally available materials. I also taught groups how to use chicken incubators, which were standing idle before. After I trained them, the hatch rate in the incubators reached 70 per cent. Farmers are really lacking knowledge and when they learn new skills, it really has an impact on their lives. I taught them how to make their own fertilizers, which saves farmers a lot of money. I also see some change after farmers received record keeping training. Lately, I taught farmers how to plant soya beans, which has a lot of market potential in Kenya. Many of them have already started, so we´ll see how it goes. You have said that Shianda has a lot of economic potential. How can farmers, WEFOCO and national government cooperate on this? Networking is a general issue. National government should partner with WEFOCO for information exchange and unlocking export potential. If local farmers could increase production to the level of export, WEFOCO could mediate and look for markets for the farmers´ production. There needs to be a better system for training farmers and WEFOCO could partner up with other organizations in the area to offer more trainings. What makes a good farmers training? A reasonable mixture of theory and practice. They need the theory as well as demonstrations in farms. It is good to identify successful farmers in the area and invite them to talk to farmers to motivate and inspire them. How can farmers contact you? How available are you? I give them my e-mail and phone number. They can visit me in the WEFOCO office. However, Africans are used to being visited, they are a little passive. They need to be encouraged to be active and come ask for advice themselves. But luckily some attitude is changing. If you have one word of suggestion to farmers what would it be? Learn modern farming techniques! It is wise to go organic and use conservation agriculture techniques. Farmers educate yourselves, so you can take the best out of this environment and offer a future and education for your children.